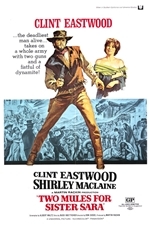 Two Mules for Sister Sara is an American-Mexican western film starring Shirley MacLaine (billed above Clint Eastwood in the film's credits, but not on the poster) set during the French intervention in Mexico. The film was released in 1970 and directed by Don Siegel. It was to have been the first in a five-year exclusive association between Universal Pictures and Sanen Productions of Mexico. 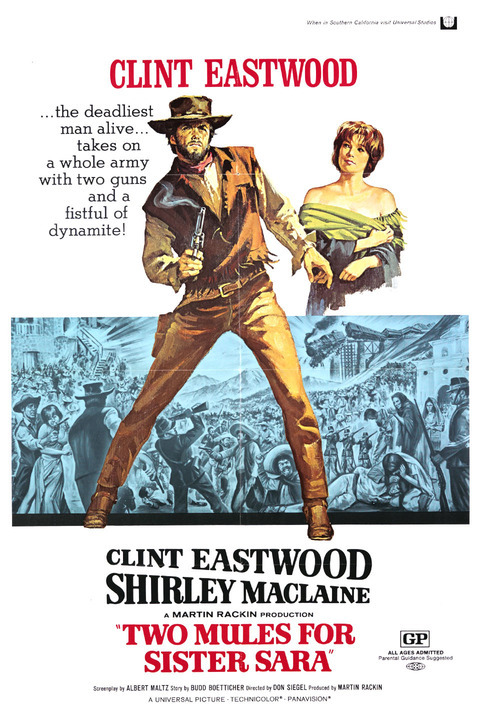 The film marked the second of five collaborations between Siegel and Eastwood, following Coogan's Bluff (1968). The collaboration continued with The Beguiled and Dirty Harry (both 1971) and finally Escape From Alcatraz (1979). The plot follows an American mercenary who gets mixed up with a nun and aids a group of Juarista rebels during the puppet reign of Emperor Maximilian in Mexico. The film featured both American and Mexican actors and actresses, including being filmed in the picturesque countryside near Tlayacapan, Morelos. Ennio Morricone composed the film music.